Our range of products include hid card (proximity). 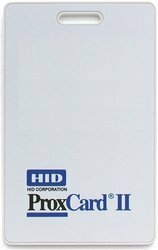 he ProxCard II proximity access control card is the industry choice for a cost-effective solution to proximity access control, with universal compatibility with all HID proximity card readers. The ProxCard II proximity access control card provides durable packaging and consistent read range. Looking for ACCESS CARD ?